Full frame (or 35mm) is a misnomer. Full frame is just the largest sensor size in small format photography. There are also medium format and large format sensors that are much larger than "full frame." A full frame sensor is the same size as 35mm film. Crop sensors are smaller (and thus, cheaper to produce). 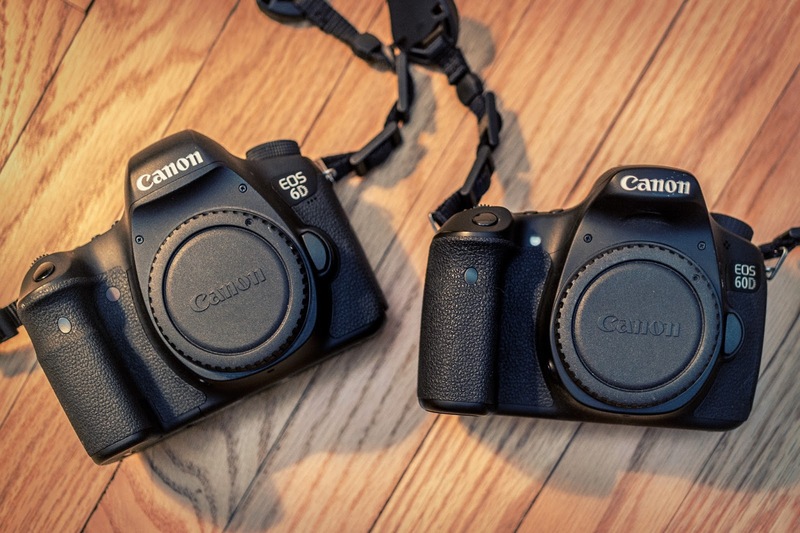 APS-C sensors (found in most consumer-grade DSLRs) are about 2/3 the size of full frame sensors. The smaller sensor means that the field of view compared to that of a full frame sensor at the same focal length is cropped by about 1/3 compared to that of a full frame sensor. Micro four thirds sensors (found in Olympus and Panasonic mirrorless cameras) are 1/2 the size of full frame sensors, so the field of view is cropped by half. The majority of consumer-level DSLRs and mirrorless cameras (smaller interchangeable lens cameras that don't contain a mirror mechanism) have APS-C or micro four thirds sized sensors. Higher resolution (not to be confused with more megapixels) than when paired with high-quality lenses. Your photos will generally show more detail, even when displayed at their maximum size (although not significantly more than images produced by a high end crop sensor). This also means that the sensor can handle a higher megapixel count and still maintain a high resolution better than a crop sensor can. Shallow depth of field more easily achieved. At any aperture, your lens will blur out the background at the equivalent of about 1.3 f/stops more than an APS-C sensor will and 2 stops more than a micro four thirds sensor will. For examples, shooting at f/1.4 on an APS-C sensor is like shooting at f/2.2 on full frame in terms of the depth of field (in terms of exposure it there is no difference). To get the full frame equivalent depth of field of f/1.4 on an APS-C sensor, your lens would have to open up to f/0.9. Few lenses have a maximum aperture that wide, and those that do are often extremely expensive. Moreover, lenses with apertures this wide are usually pretty soft when shot at their widest aperture (also called shooting "wide open"). It is even hard to blur out the background on a micro four thirds sensor. That being said, more and more options are being made available to crop sensor shooters looking to create shallow depth of field. Less noise at high ISOs. When shooting in low light and using high ISOs is a must, a full frame sensor will create an image with significantly less noise than an crop sensor can. While the gap is closing somewhat on this as camera manufacturers are improving sensor technology, full frame sensors are still a clear winner here. Larger viewfinder. This only applies to DSLR cameras. When you look through the viewfinder of a full frame DSLR, the viewfinder is typically larger than that of an APS-C camera (the actual size varies from camera to camera though), making it easier and more enjoyable to compose your shots. If you're a casual shooter or tend to use live view a lot, this won't mean a lot. If you're a pro or a serious hobbyist, this makes quite a difference. If you have old lenses from your film days, they give the same field of view as they did on 35mm film. 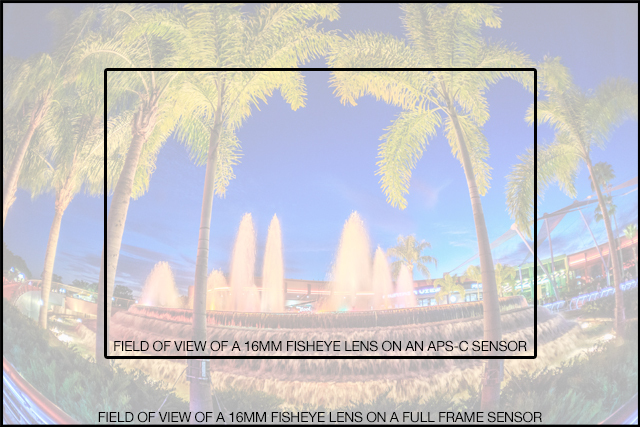 APS-C sensors are about 2/3 the size of full frame sensors, so your effective field of view is cropped by 1/3. This is especially important with wide angle lenses, which are noticeably less wide when used on crop sensors. Beware though, not all "old" lenses are compatible with current cameras. Be sure to do your research to see if yours are. 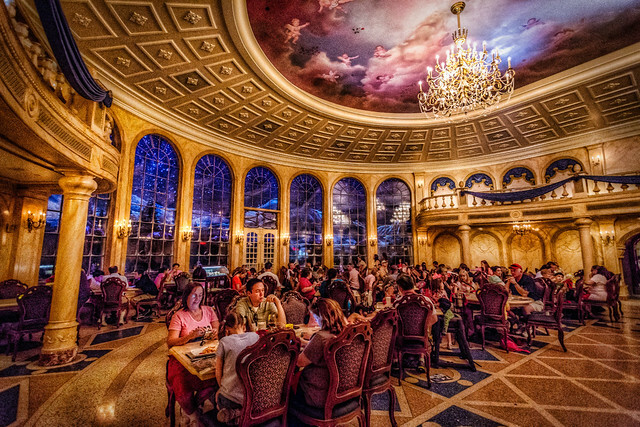 This photo of the ballroom at Be Our Guest Restaurant at Walt Disney World was shot handheld at ISO 12,800 on a full frame camera. There is certainly some noise and loss of detail in the shadows, but I was able to remove most of the noise in Adobe Camera RAW. If I had shot this on an crop sensor camera at the same ISO, it would have probably been unusable. 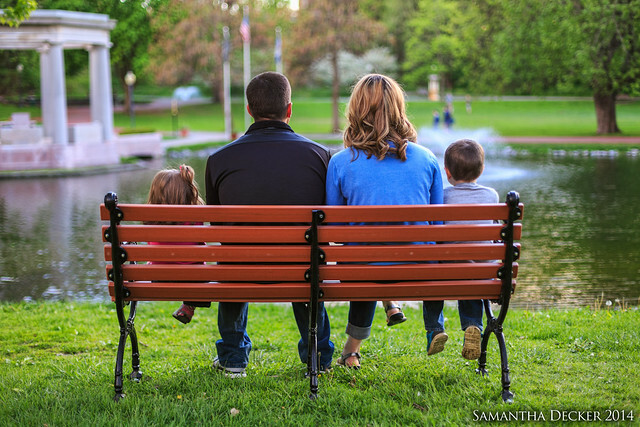 I shot this portrait of my colleague and her family at f/1.8 on a full frame camera. I would have needed a lens with an aperture of f/1.1 on an APS-C camera or f/0.9 on a micro four thirds sensor, which would have cost a lot more money and wouldn't have been as sharp. Typically more vignetting and softer corners at larger apertures. While you will get some of this with APS-C sensors (less so if using full frame compatible lenses), it's generally more pronounced on full frame cameras. Lenses and cameras are usually much more expensive. This is relative, of course, but just by nature of the sensor size, high-quality or fast-apertured lenses compatible with full frame cameras generally cost much more than those designed especially for APS-C sensors. The image sensors are substantially more expensive to create, making the cameras generally quite a bit pricier too. Full frame cameras with lots of bells and whistles (such as a fast burst rate or an advanced autofocus system) are significantly more expensive than APS-C cameras with similar features. Even more important to note here is that the image quality gain isn't necessarily commensurate with the price increase. APS-C cameras and lenses have gotten quite good lately, so the pros cameras with similar features. Cameras and lenses are generally bigger and heavier. While full frame cameras are being made smaller and smaller these days, I can't imagine they'll ever catch up to the smallest APS-C cameras. The lenses are even harder to make smaller and lighter than the cameras. Telephoto lenses don't reach as far. Given the larger sensor size, it's much harder to get the reach necessary to photograph far away subjects than it is with an APS-C camera. 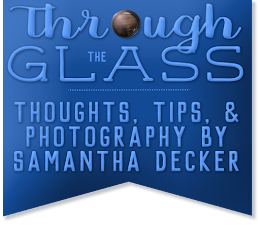 In the case of telephoto lenses, this means you'll need to purchase a lens significantly (and I mean significantly!) larger and heaver if you need far reach. For this reason, I sometimes use my APS-C camera when photographing wildlife or other far away subjects. Keep in mind, though, that if your full frame camera has more than 33% more megapixels than your APS-C camera, you're probably better off just cropping than using the APS-C camera. Lenses designed for APS-C cameras usually aren't compatible with full frame cameras. This is because the image circle is a lot smaller. In some cases you can still use the lens but with heavy vignetting or completely black edges. On Nikon cameras there is a DX mode that allows you to use them, but you're basically cropping away 1/3 of the image, wasting so much of that expensive sensor you paid for when you bought your camera. Canon EF-S lenses, which are designed just for APS-C sensors, can't even be mounted on full frame cameras due to the way they are designed. All in all, this means a smaller lens selection to choose from and it means you will probably have to replace most of your lenses when you upgrade, unless you own only full-frame compatible lenses. 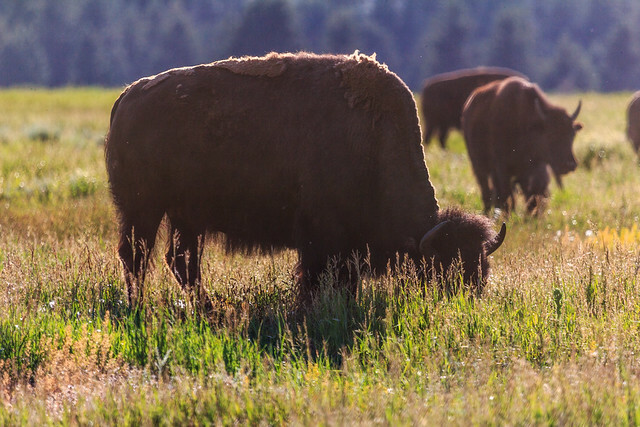 I shot this photo of a bison at Grand Teton National Park at 400mm on a Canon 60D, which has an APS-C sensor. If I had shot this on a full frame camera, I would have had to crop it quite a bit to get the bison this large in the frame. The bottom line about sensor size is that both full frame and crop sensors have their pros and cons. While I shoot about 85-90% of the time with a full frame camera, I also have two crop sensor cameras (a DSLR and a mirrorless) that I use in situations when the smaller sensor gives me an advantage (either because it gives me more reach or because I need a smaller camera). Which sensor size are you feel is best for you, and why?